The Old Vic was more Laurence Olivier’s territory than Vivien’s. Although she was later invited to lead two tours, she wasn’t an official member of the repertory company. However, she did perform on stage here in the Christmas 1937 production of Shakespeare’s A Midsummer Night’s Dream and she could often be spotted in the audience when Olivier was on stage. 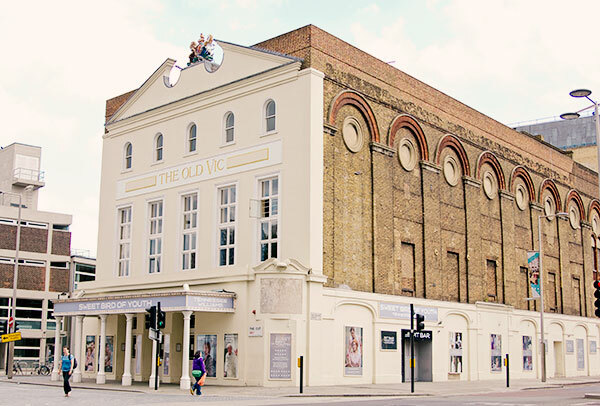 The Old Vic housed the National Theatre Company in the 1960s while the National Theatre was being built on the Southbank. Directions: Start your journey at Waterloo station (Bakerloo, Jubilee, Northern and Waterloo and City Lines). Take the Waterloo Road exit by following signs downstairs to McDonalds. Turn right and you’ll see The Old Vic standing proudly on the corner of Waterloo Road and The Cut. That 1970s brick building next door is the National Theatre Archive. Recommendation: If you have time, you should definitely book a backstage tour. They’ve got a wonderful guide called Ned who knows the ins and outs of the theatre and its history like the back of his hand. In 1949, Vivien made headlines for her performance as Blanch DuBois in the then-controversial A Streetcar Named Desire. The play was staged by Irene Mayer-Selznick and Hugh “Binkie” Beaumont, and directed by Laurence Olivier at the Aldwych. Directions: From the Old Vic, walk down Waterloo Road toward the Thames. Cross Waterloo Bridge (unfortunately, this is not the same bridge using in the Vivien Leigh film of the same title, which was made in Hollywood. There are stunning views of the City and St Paul’s though, so make sure you have your camera handy). If you look down just before crossing the river you’ll see the National Theatre, BFI, and the strange statue of Laurence Olivier. Cross the street at the Strand and turn right on Aldwych. The theatre is just on the other side of the Waldorf Hotel. The legendary Savoy Hotel had special significance for Vivien’s life. The Savoy and the neighboring Coal Hole pub were popular hot spots for London’s theatrical crowd. It was in the Grill restaurant that she met Laurence Olivier for the first time. As Vivien told it in 1960, she had been dining there with Gladys Cooper’s son John Buckmaster when they spotted Olivier at a nearby table having dinner with his wife Jill Esmond. Buckmaster remarked how silly Olivier looked without his Ronald Colman-esque mustache, and Vivien hotly retorted that she didn’t think he looked silly at all. They were formally introduced later that evening. Directions: From the Aldwych, retrace your steps to the Strand. Walk toward Trafalgar Square and the Savoy will be on your left. Recommendation: The Savoy Grill is now owned by my favorite celebrity chef, Gordon Ramsay, and has been remodelled to hark back to the restaurant’s art deco days. The food is amazing so I’d highly recommend having a meal there. Reservations required. Even if you can’t get a table, it’s worth going into the hotel itself as there’s a small museum with some unique Savoy artefacts, including Olivier’s registration card showing when and in which room he spent nights there with Vivien during the war. 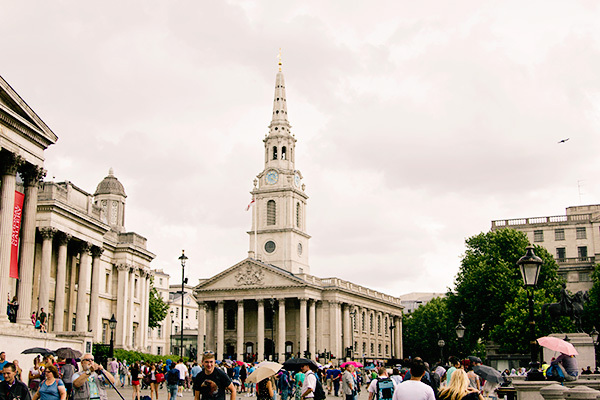 If you keep walking down the Strand you’ll find yourself in Trafalgar Square where you’ll see the National Gallery and St Martin-in-the-Fields church. This was where Vivien’s public memorial service was held in August 1967. It’s a beautiful church so if you have some free time, why not stop in for a free lunchtime concert or a meal in the crypt? 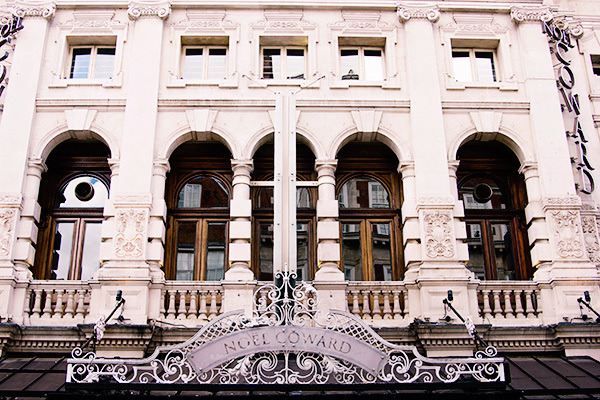 The Noel Coward Theatre (formerly the New Theatre) in St Martin’s Lane was, like the Old Vic, primarily Laurence Olivier’s territory. But Vivien did perform here in winter 1949 when Olivier split from the Old Vic and formed his own repertory company under Laurence Olivier Productions with Vivien as his leading lady. This was the beginning of the famous Olivier-Leigh “Theatrical Royalty” stage, and they acted together in Antigone, The School for Scandal, and Richard III. Although you won’t see many dancing buskers today, the 1938 Vivien Leigh film St Martin’s Lane (Sidewalks of London in the US) was filmed on location in and around this area. Directions: Facing Trafalgar Square, turn right past the Chandos pub and head up St Martin’s Lane toward Shaftesbury Avenue. The theatre will be on your left. Detour: I couldn’t get a good photo as it was closed last time I stopped by, but the Actors Church in Covent Garden is just down the road from the Chandos pub. Instead of walking up St Martin’s Lane, head east to Bedford Street and turn left. You’ll find the entrance to the church next to Paul Patisserie (grab a macaron for nourishment while you’re at it). Inside there are several memorial plaques dedicated to famous theatrical figures. Among them, just to the left of the entrance, you’ll find Vivien Leigh’s. 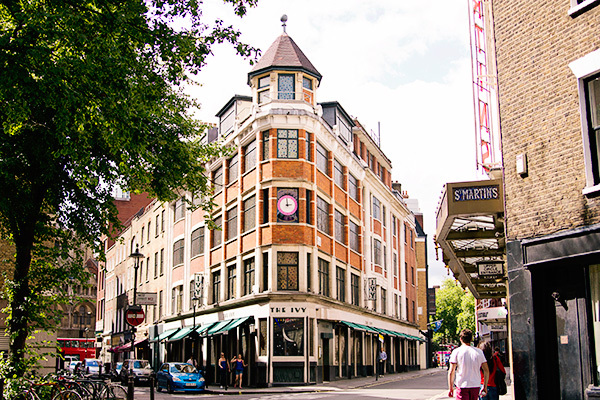 The Ivy is another of Theatreland’s legendary restaurants, and Vivien Leigh was a frequent customer, often stopping in for lunch with friends or for dinner after performances in the West End. Nestled in West Street between St Martin’s Lane and the Charing Cross Road, The Ivy hasn’t changed much since Vivien’s day. You still have to dress for dinner and make reservations in advance, and, if you’re lucky, you can still rub elbows with famous people. The food is pretty pricey but excellent if you’re looking for a romantic meal for two. 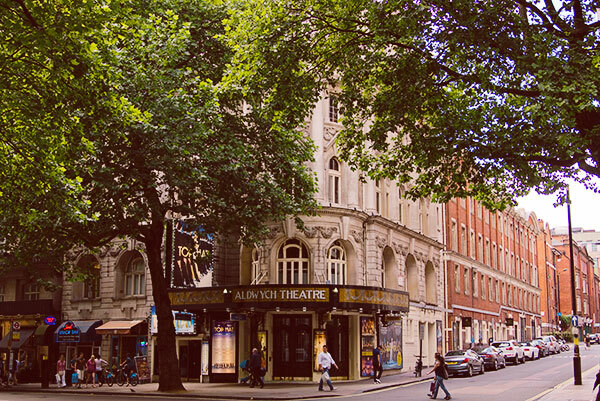 Directions: From the Noel Coward Theatre, walk up St Martin’s Lane toward Shaftesbury Avenue. Turn left onto West Street after Orion House. 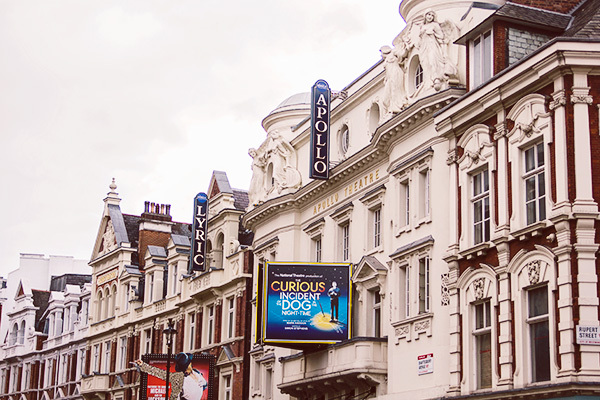 Walking along Shaftesbury Avenue toward Piccadilly, you’ll notice the Apollo and Lyric Theatres side by side. Vivien Leigh performed in both venues in the 1950s, in Look After Lulu (Lyric, 1956) and Duel of Angels (Apollo, 1958). 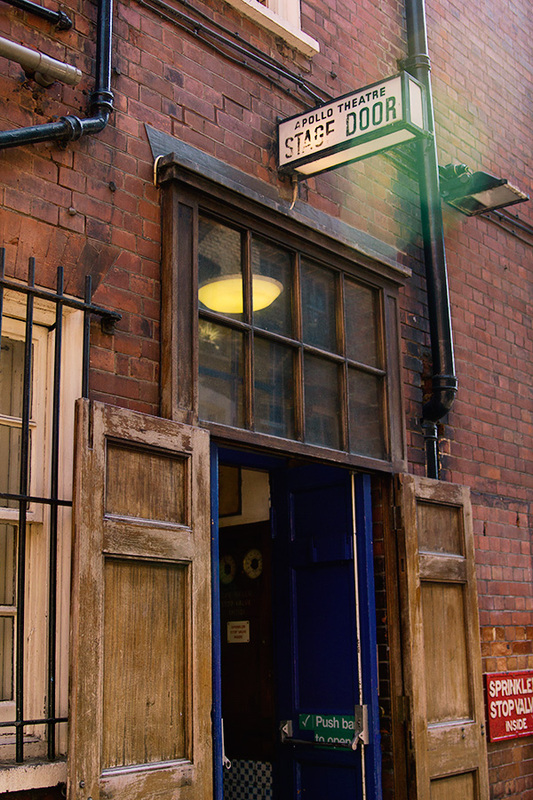 If you walk around to the back of the Apollo you’ll see the classic stage door where Vivien would have made her exit after shows. Detour: If you bypass Shaftesbury Ave. and keep going up Charing Cross Road toward Tottenham Court Road, you’ll see the Phoenix Theatre on the right, just across from from Foyle’s book store. This was where Vivien Leigh played Sabina in The Skin of Our Teeth in 1945 before she fell ill with tuberculosis. In 1942, Vivien Leigh made her return to the British stage after her successful sojourn in Hollywood. 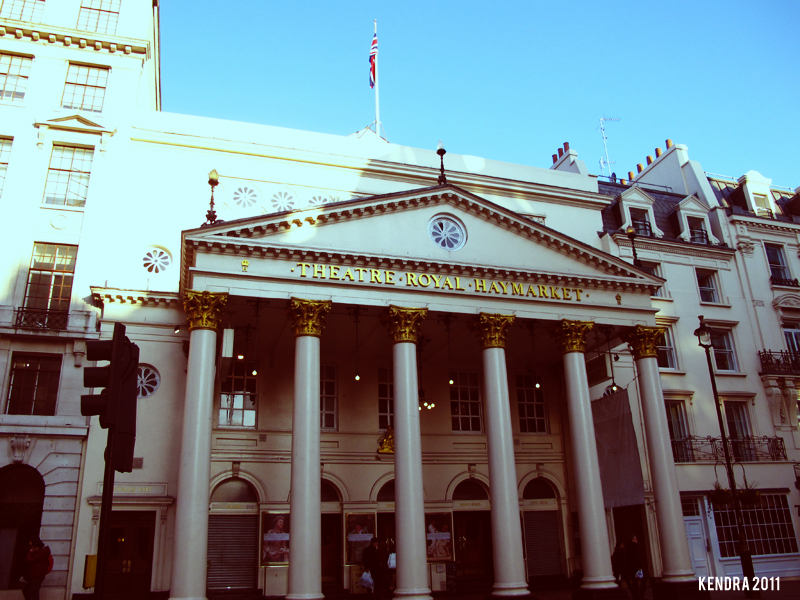 The play was George Bernard Shaw’s The Doctor’s Dilemma and it was staged at the Theatre Royal, Haymarket. Vivien didn’t particularly like the part of Jennifer Dubedat, but she did think the long run was a good lesson in professional discipline. Laurence Olivier, by then serving in the Fleet Air Arm and stationed down south near Worthing, occasionally shirked his military duties and drove up to London to watch his wife perform. Apologies for the old photo, the theatre is currently hidden under scaffolding. 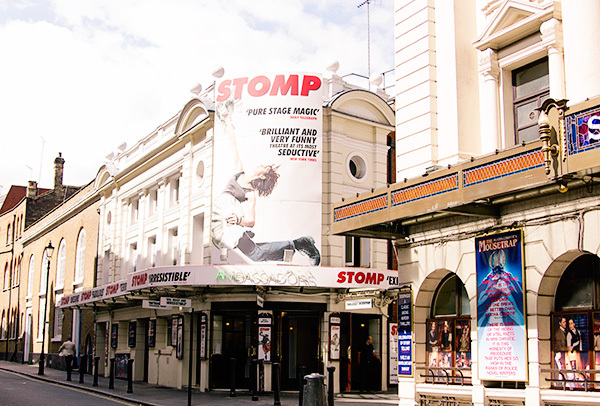 Directions: From Shaftesbury Avenue, walk down to Piccadilly Circus and straight down Haymarket where you’ll see the theatre on the left. The Golden Lion pub in King Street isn’t really the spot we’re looking for here. 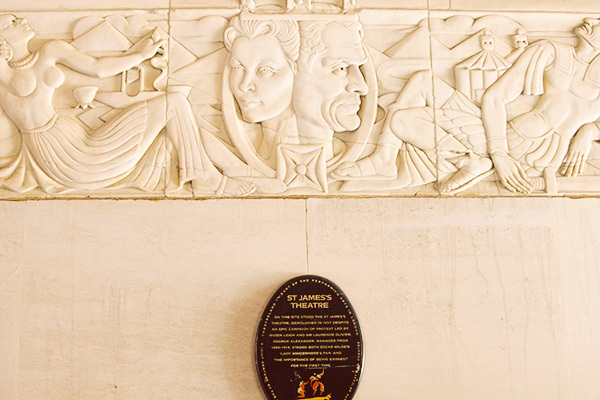 But if you look on the wall opposite the entrance to the pub you’ll see this relief of Vivien Leigh and Laurence Olivier and a plaque commemorating their efforts to save the St James’s Theatre, which stood on that very spot. The Oliviers performed here in the two Cleopatra plays in 1950, before taking the double bill to New York for a successful season on Broadway. Olivier leased the theatre under Laurence Olivier Productions, performing in and producing several plays. The fact that it was “theirs” meant much to Vivien, and when developers threatened to demolish it, she staged a gallant protest in 1957. 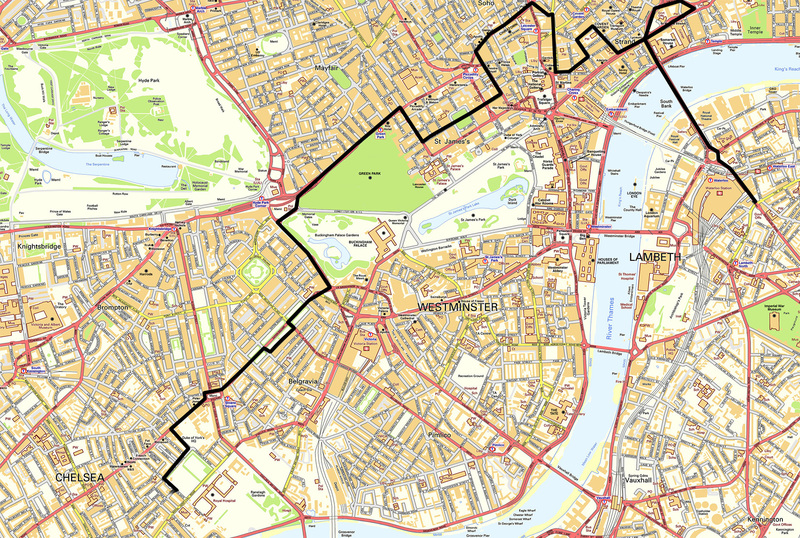 Directions: From Haymarket, walk down St James’ Street, through St James’ Square and on to King Street. The Golden Lion pub sits across the street from Christie’s auction house. Pro tip: There are some beautiful portraits of both Vivien Leigh and Laurence Olivier lining the stairwell leading up to the top floor of the Golden Lion. 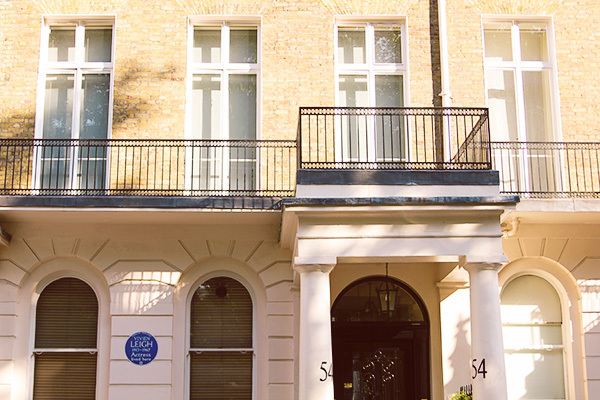 Flat D in 54 Eaton Square in the fashionable Belgravia district was Vivien’s city home from 1958 to the end of her life. After her death, her mother Gertude dedicated a memorial bench in her honor. It sits in the corner of the garden opposite to this day. Visitors may or may not have a difficult time getting in to see it, though. The garden is accessible to residents only, and a key is needed to get in the gate. Today, 104-year-old Academy Award-winner Luise Rainer lives in the flat. Directions: The trek between St James’ and Belgravia is quite a long one. At this point, if you’re not up for walking, you can catch the tube from Green Park to Victoria. Once there, walk through Grosvenor Gardens to Eccleston Street. Make a right, and then a left at Eaton Square. Number 54 will be on your left. 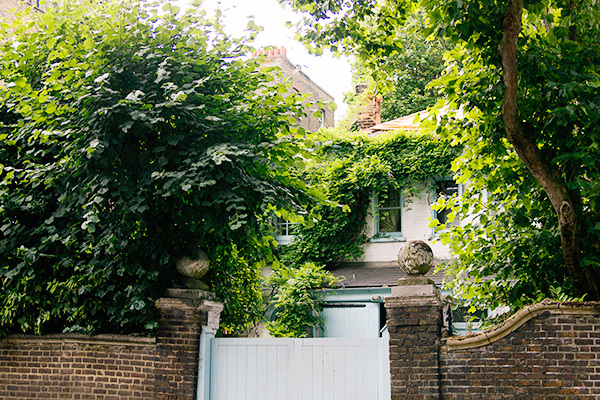 The last stop on our tour, and possibly my personal favorite, is Durham Cottage, the quaint and adorable house in Christchurch Street, Chelsea. The cottage was purchased by Laurence Olivier in June 1937 as a love nest for himself and Vivien. It remained their London base until 1956. Directions: From Eaton Square, walk west toward Sloane Square (here you’ll see the Royal Court Theatre where Vivien opened in South Sea Bubble, 1959, and Olivier performed his famous Archie Rice in The Entertainer) and keep west on the King’s Road past the Saatchi Gallery and Partridges until you get to Cheltenham Terrace. Turn left and then right on St Leonard’s Terrace, left at Ormonde Gate, and right onto Christchurch Street. Durham Cottage is number 4 on the right. You can’t miss the bright blue gate. 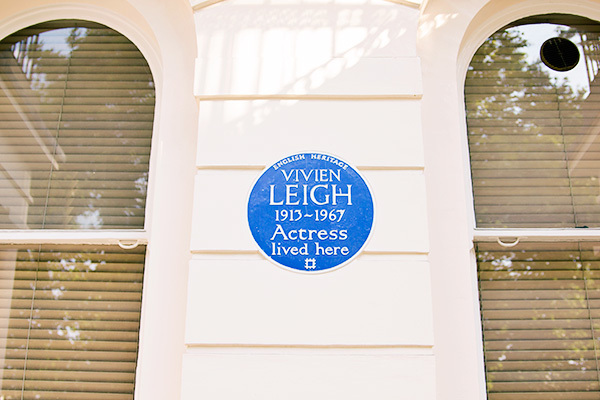 I hope you enjoyed this virtual tour of Vivien Leigh’s London. If you have a favorite spot, let me know what it is in the comments! The Durham Cottage is beyond words! I can just see Larry’s excitement upon finding this adorable and secluded home knowing it would be here that his relationship would begin with Viv. This has to be my favorite. Thanks for your tireless research with these locations. I loved your book and I adore your photos. Thank you for sharing. 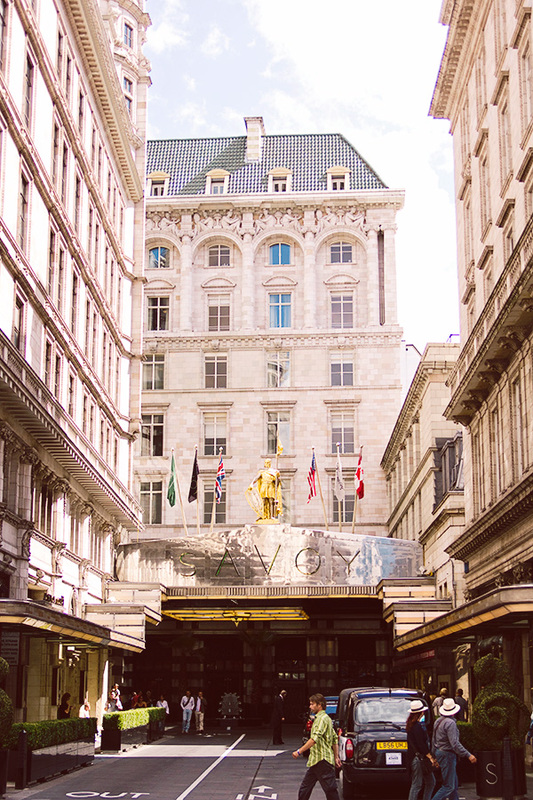 The Savoy has seen many famous people come and go. I met Bob Hope in the fotey of that famous hotel in the 1980’s, when my friend and I had gone to see the famous Savoy stage area where the old dance bands played in the 1920’s, 1930’s and 1940’s. I went over to Bob with a scrap of paper and pen and politely asked his minder if I could ask him for an autograph, he said yes and I still have it, now proudly encased in a frame [what a coup]! I should have sent the Walsall Advertiser link, above, on April 1st, but eh oh I couldn’t resist………. Thanks so much for sharing these documents with us. You ‘re really wonderful ! It’s so difficult to find real information ! 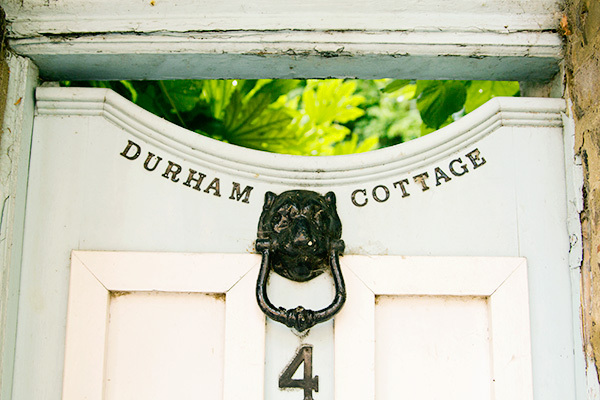 I hope I ‘ll have the possibility to go to London one day and see Durham cottage !!! I love your webasite – beautiful tribute to Vivien leigh and Larry olivier – a truly unique couple . Lovely photos and congratulations on the site and on your wonderful book which i love.